I don't sail, but I do watch TV. The other night, Brian pressed Play on a 60 Minutes Sports episode about these crazy things-that-resemble-sailboats and despite that I have no particular interest in boating, I was fascinated. 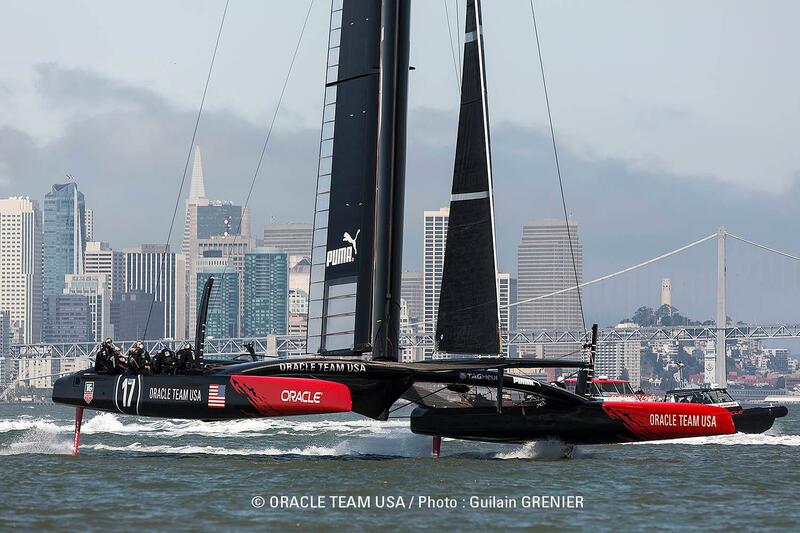 Apparently there is a big sailing race called America's Cup (or the America's Cup?). I know absolutely nothing about it except for what I saw on the 60 Minutes episode. Where I grew up, sports involved a stick or a ball or maybe even a pool, but definitely not a multi-million boat. I'm not saying that sailing isn't a sport, because it most certainly appears to be; I'm just saying that it's not my kind of sport. But 60 Minutes gets me every time. Anyways, these boats have wings; literally, like airplane wings, and the tallest wing is 13 stories high. Like most things with wings, these things fly. I don't think sailors use "miles per hour" but 60 Minutes was kind enough to convert the units for us land-dwellers. Apparently these boats go about 55 miles per hour, and almost literally, they blow any other type of boat straight out of the water. Here's the problem (aside from the fact that this billionaires’ hobby could feed millions of starving people) -- there's very little room for error. Just last October, the Oracle boat flipped and broke into pieces. It was eventually dragged to shore and rebuilt, although that effort took four months of 80-hour work-weeks by 24 expert boatbuilders (hence, the $100 million estimate). People claim this new sport (or new version of an old sport) is the NASCAR of sailing. It certainly has the speed and the danger that comes with NASCAR (not that that’s my kind of sport, either). Just last month, a British Olympic medalist, Andrew Simpson, was killed with the Artemis team boat capsized in San Francisco Bay. Simpson’s death provoked more questions as to whether the sport has gone too far. And that is what has me still thinking about this 60 Minutes episode over a week later -- the concept of "too far." What is “too far”? As Americans, I don't think we're usually bred to know. Last week, I went back to the binders that Rachel remade for me a few Christmases ago. I pulled out the Africa binder and flipped to the divider marked, Imperialism. I immediately found what I had been looking for -- a photocopy of what had clearly been two wet pages of The Poisonwood Bible. I love that book, and the excerpt I posted last week is one of my favorite excerpts within its hundreds of rich and brilliant pages. If only a river could go uncrossed, and whatever lay on the other side could live as pleased, unwitnessed and unchanged. During this lesson, my students and I would discuss the concept of progress. What is progress? Is it always good? What were some examples of how progress can sometimes bite back? How ironic given my last post. Now more than ever, I appreciate progress. Progress made Herceptin and Herceptin is saving my life. Progress taught doctors how to remove an appendix when it bursts, and I thank God for that because Rachel had her appendix removed through emergency surgery on Sunday morning. I don’t go an hour without being appreciative of these steps forward. As I emerge more fully from my cancer cocoon, I’m looking around and trying to decide what my role will be in the breast cancer world. Ninety-eight percent of me wants to help make more progress towards curing breast cancer and supporting anyone who is forced to deal with the terrible disease. The remaining 2% of me is selfish and scared. It wishes I could just be cured and move on; that I could find a way to stay sheltered from any more pain that comes from a world full of cancer. Establishing a new role in any significant effort is rarely easy and when that effort is deeply personal, it's even harder. So I've thought a lot about where my place will be. Should I wear pink and walk to raise money every year? Should I talk to patients at Dana-Farber, or better yet, should I listen to them? Or should I just keep writing? Do I owe anything to those who will come after me and if so, how much? These aren't easy questions and I would guess that any grateful cancer patient grapples with them at some point. Obviously writing has been one of the key sails (or wings) on my life boat these past eleven months. So I figured I should start there. A few months ago, I copied all of my blog posts into a Word document. It was over 600 pages long, single-spaced. I wrote an introduction and I cried when I returned to certain corners of my memory. For a few weeks, I lightly edited, fooled around with fonts, and fell asleep at night thinking of a title (I still don't have one that I love). I started to think that a book was being born, or at least, conceived. Then, I thought some more. My mind returned to the Poisonwood Bible passage about crossing rivers. In fact, the very night that I typed out those words happened to be the night that Brian clicked onto the 60 Minutes episode about the world’s fastest sailboats. Recently, I have been thinking a lot more about what I ultimately want to come of this blabbering blog. Of course, I want my kids to one day see it, and thanks to my dear friend, Lynne, I already have three pink binders (and counting) to show them. As for sharing it with others, I have been trying to decide if I want to dedicate hundreds of hours to an effort to turn these blabberings into something that an agent and a publisher may want to support. 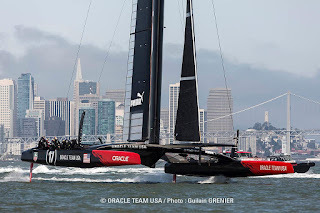 I’m certainly not comparing that work to rebuilding the Oracle boat, but there are two powerful similarities – they both require seemingly countless man-, I mean, woman-hours, and neither of them would be a sure bet of making any real progress. This past hot summer Monday, the kids were home, Brian had work, and it was my day "off" (in quotes because I honestly believe that staying home with kids is more work than working). That day, I didn’t make any progress on any potential book – no query letter drafted, no edits made to the “All Text” document of my collected blog entries, no following up on any leads to try to make a book actually happen. Instead, Teddy, Annabel, and Teddy’s best bud, Liam, and I spent the morning at a small lake in a neighboring town. The beach is small and scattered with leaves and rocks. The dock is a bit rusty and even at $6 for the group of us, there was no line of people waiting to get in. It was perfect. After we dragged what felt like half the universe out of the car, the kids kicked off their Crocs and we spent a few hours in the water. The kids jumped off the dock as I told them what to yell before they went under (“Your favorite Red Sox player!” “Who will win the Bruins game tonight!”). It was Heaven, even considering the typical turbulence of trying to get my kids to leave a place they love. All of this has really made me wonder – Where is my place as a breast cancer survivor? Do I have anything that I should share and if so, what would I sacrifice to put it out there? Let's talk hypotheticals. Let’s just say that hundreds upon hundreds of hours of drafting and editing and, let’s be honest, flat out begging and a stroke of miraculous luck, yields me a book deal. Then what? What will be on the other side of that river? I have absolutely no idea. I guess, from the small amount I’ve heard and read of author's lives, there could be a book tour. But I don’t want to be in a hotel by myself on a book tour. I want to be at the lake with my kids (and Liam, of course). I want to be sitting on our screened in porch on a Saturday night with my husband and I want the usual chaos of a Sunday night dinner at my parents’ house. So maybe making this blog into a book is taking it too far. Maybe that river should go uncrossed and whatever lay on the other side should live unwitnessed and unchanged. I know, it’s so wholly un-American to think this way – to stop and say, I’m happy with what I've done; I don’t need to do more, be better, go faster. Then I wonder, Would someone else be better if I crossed that river? Is there a young woman on that other bank that could benefit from something I've been through? I’m not saying that I could rescue anyone from cancer’s suffocating pain because I certainly can't. But could my story make someone else feel less alone in this fight and in its aftermath? Would sharing my experiences beyond the blogosphere make me feel that way? Or am I as foolish as the Portuguese -- thinking, if only subtly, that I could help others when really, they already understand things far better than I ever will? It's hard to leave a great river uncrossed and I'm pretty sure that we risk regret either way. So all I can do is rely on what I know for sure -- first, that I'm not going to try to cross any great river until I know exactly why I'm doing it. And second, I won't go anywhere if my family can't come with me.